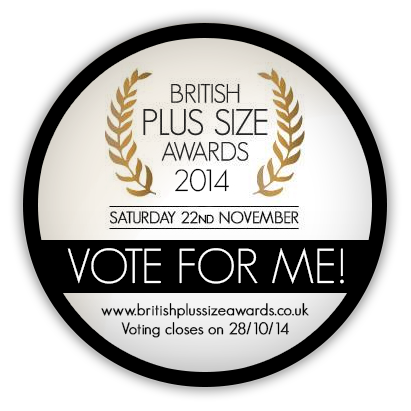 Some of you might remember last month that I was nominated for a British Plus Size Award. I'm really proud and excited to be up for Best Blogger, it's a really strong category and I'm alongside some of my closet friends, so I'm hoping one of us can win it, and of course I won't lie when I say, I hope it's me. I know I don't need to tell you guys how much this blog means to me and what it's done for my life. Quick, get the violins out, it's time for an Xfactor-esque sob story, thing is I was genuinely at a very low and quite frankly dangerous point in my life and my mental health was the worst it had been for a very long time. I was scared and lonely and had very little sense of self worth. Finding the blogosphere changed everything. On an absolute basic level, it gave me a reason to get up and get dressed. No one wants to see a fashion blogger wearing stinky old pyjamas and sporting 4 day old, greasy hair. So, I started investing in fashion again and in my appearance. On a deeper level it gave me a space to be me, to remember who I was before the baby came along and various crises had stripped me of my spark. And when I was feeling low, and not having a good day it gave me solace, a space to pour my heart out and talk to like minded folk who understood. And it brought me some truly wonderful friendships. So I thank you. And this has turned into something far more emotional than I intended it to. Sorry about that. I just wanted to express how much my blog means to me and how getting recognition for that in whatever form always feels wonderful. I've got my dress, and my shoes, I've making excited plans with my favourite girls for a weekend of food and booze and glamour and I've been practising my gracious loser face just in case. So, if you think I deserve to win I would of course love your vote. Click on the logo above or to the top right of this page. Thank you guys, really. I tried to vote but cannot as I have to vote on every single category and some of those I have not heard of a single person in them. A shame as you'd get my vote.